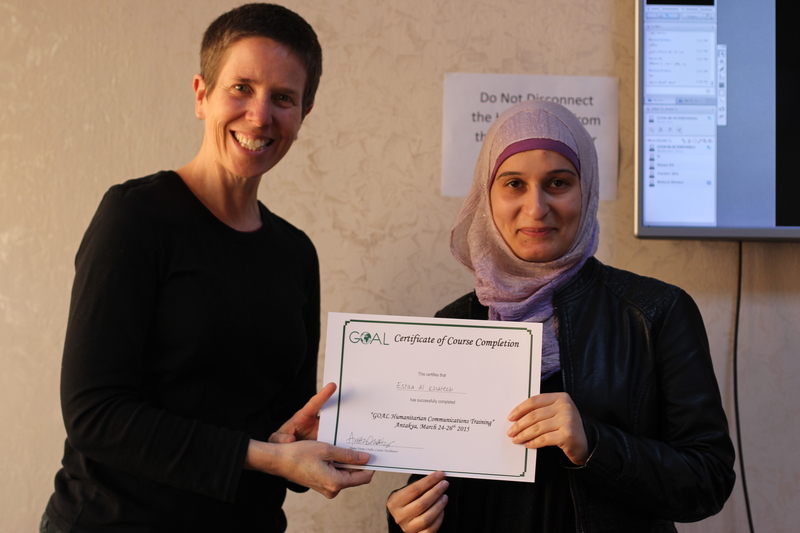 Anita Verna Crofts, the Associate Director of Academic Affairs for the Communication Leadership program, recently visited Turkey to lead a three-day humanitarian communications training for GOAL Syria. GOAL is a humanitarian organization dedicated to development and access. Upon her return, she reflected on her experiences with us. How did you get the opportunity to lead this training in Turkey? This is the second humanitarian communications training I have designed and delivered for GOAL. The first was three years ago in Sudan. My connection to GOAL is a UW connection: Vick Aken, Head of Country office of GOAL SYRIA, and I met a decade ago at the UW Daniel J. Evans School of Public Administration. Being part of this campus grows my network galaxy in the best ways. Have you ever been in this situation before, teaching someone in a war zone? No. While Sudan is no stranger to conflict (I was there just before the south voted to form a sovereign nation), the current situation in Syria is by far the most unstable and violent region of the world I’ve been exposed to with this kind of training. As I wrote in my blog post, the fact that the tranquil town of Antakya in Turkey where I was based is only 12 miles away from the chaos in Syria was hard to imagine. That’s closer than the cab ride between my home and SeaTac Airport. What’s the number one thing you learned from the experience? It’s a lesson I’ve learned many times over that bears repeating: everyone deserves to live in safety, with dignity, and know love. And a bonus lesson: when traveling to Turkey one should do and eat everything COM faculty member Ekin Yasin recommends. Her insights were invaluable. What do you hope to continue to get out of opportunities like this? Our senses heighten when we travel–everything is new. I love experiencing that wonderment my surroundings and people provide. It makes me a better person. Are there plans to continue to do these types of programs? I hope so. In my final report to GOAL, I suggested that the framework continues to have wide application to their various country offices. Even though the challenges facing the GOAL SUDAN and the GOAL SYRIA offices have their distinct realities, no matter what corner of the world GOAL works in, there are compelling stories that can–and should–be told. To read more of Anita’s reflections of her trip to Turkey, check out her story on “Flip the Media” here: http://flipthemedia.com/2015/04/stories-showcase-resilience-everyday-acts-hope-humanitarian-communications-war-zone/.